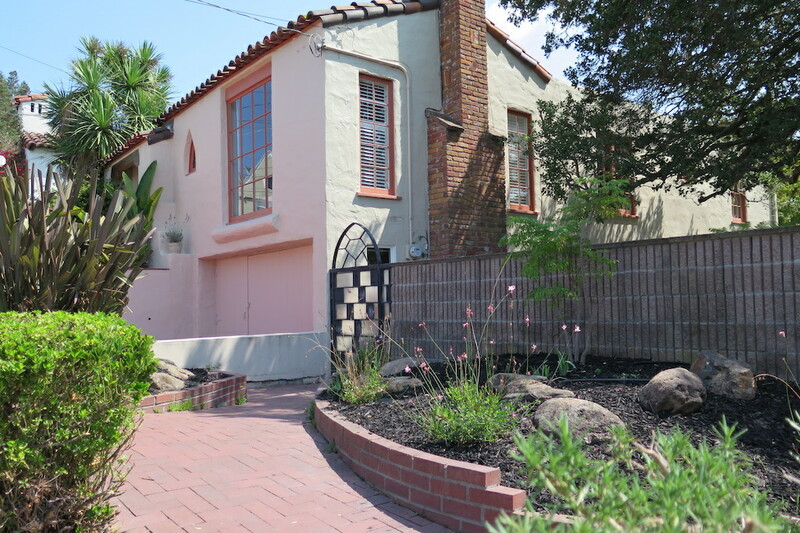 Ultra charming Mediterranean home for sale in Oakland’s Oakmore Neighborhood. Comfortably nestled in Oakland’s Oakmore Neighborhood is 4162 Lyman Ave. A charming Mediterranean Bungalow with 3 bedrooms and 2 full bathrooms. The location is perfectly situated below the Montclair Village that is just 1.4 miles away and above the Neighborhood of Glenview which is only .9 miles away. As you enter the home through a heavy wooden door and you’re immediately greeted by the wide plank hardwood floors that flow throughout the living and dining rooms. An original solid mantel and wood burning fireplace balances the living room that is illuminated by tall windows. A formal dining room is set off of the kitchen. It offers tile counters, stainless appliances and an additional room that’s perfect for a breakfast nook or small home office. Two spacious bedrooms and a full original bathroom finish out the upper level. An interior staircase leads to the lower level with a large third bedroom and the second bathroom. There is also a separate kitchenette making this area perfect for guests or as an au pair or in-law area. Step outside the rear doors and you enter your own private garden oasis. There are two large bricked patios perfect for quiet evenings or barbequing with friends. Dine alfresco in one area then retire for relaxation in another. The fertile soil and spacious terraced garden areas will make you wan to grow your own vegetables. A few steps down and you’ll feel as though you’ve entered your own private orchard. You can pick your own fruit from several of the mature fruit trees. Location, character and outdoor living. The only thing missing from this beautiful Mediterranean home is you! *Square footage is as per the public record and is not guaranteed. 4162 Lyman is brought to you by Brian Santilena. Realtor in Oakland’s Oakmore District. For more information feel free to call Brian at 510-501-3534. Thank you. Brian Santilena.